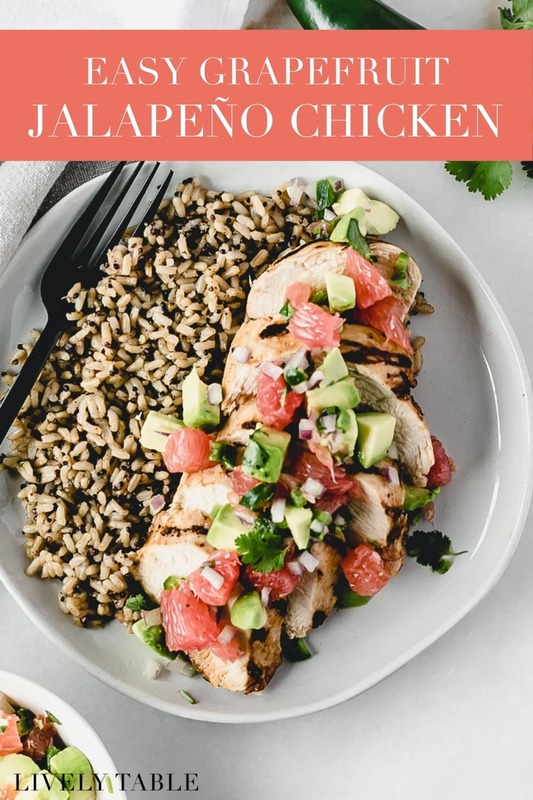 Grapefruit Jalapeno Chicken is the perfect healthy meal to transition from winter into spring. Full of flavor and ready in under an hour, this chicken will become a staple in your house! This post is sponsored by my friends at WinterSweetz. Thank you for supporting the brands that keep Lively Table going! Who is ready to come out of hibernation and jump into spring?! I sure am. I am not a fan of cold weather. Luckily, the temperatures here is Texas are warming up and the sun is shining, giving me all the spring feels! Spring is such a lovely time for food inspiration. Everything green starts showing up in the markets and warmer weather means that Mr. Table wants to bust out the grill (yay!). But if you are still in transition mode and haven’t started seeing all the green things in your grocery store yet, the transition from winter to spring can be made a little easier with late winter citrus. Right now is the perfect time for sweet and juicy WinterSweetz Texas ruby red grapefruit. They give your meals the fresh ‘pop’ that you need to bring out those sunny day feelings. And if it’s still a little chilly and gloomy where you are, this meal is just what you need to get you in the mood for spring. 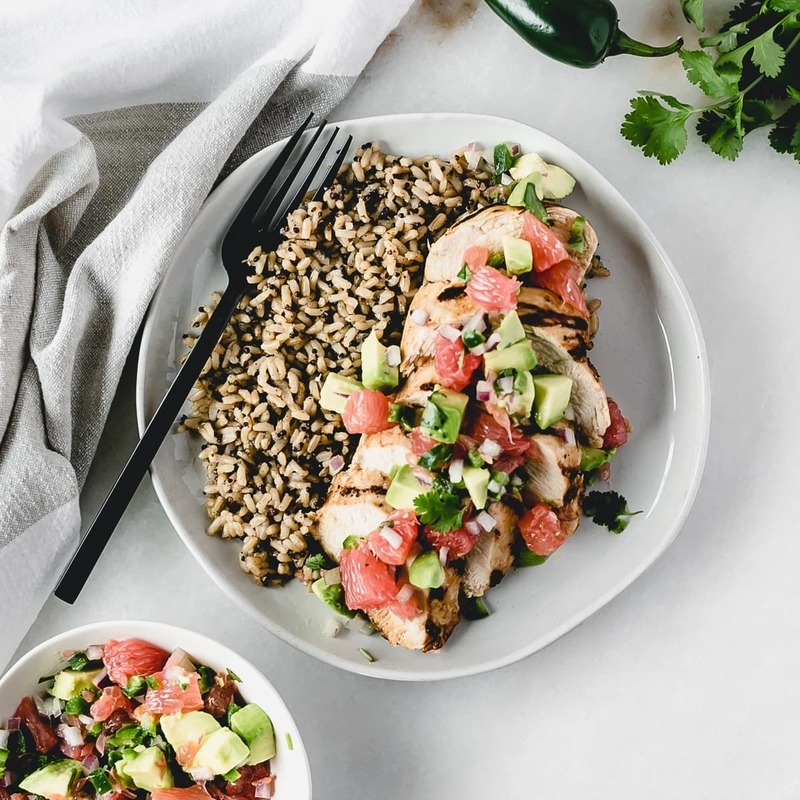 To celebrate the lovely sunny days ahead and the delicious, sweet grapefruit here in Texas, I made a fabulous chicken recipe that’s perfect for your grill! Including marinating, it can be on the table in less than an hour, and it’s bursting with flavor thanks to sweet grapefruit, spicy jalapeno and creamy avocado. Reminder: for the best flavor, segment your grapefruit using the method described in the recipe, or watch this short video. I promise it will change the way you eat grapefruit forever. Section the grapefruit by cutting off the round top and bottom of the peel. Working around the grapefruit, remove peel from the sides, getting any visible pith. Then, use your knife to cut between one membrane and a segment, pushing outward to free the segment from the membrane on the other side. Continue, working your way around the grapefruit until you have no more white. Finely chop half of the grapefruit segments and add to a gallon-sized zip top bag with worcestershire, salt, pepper, and paprika. 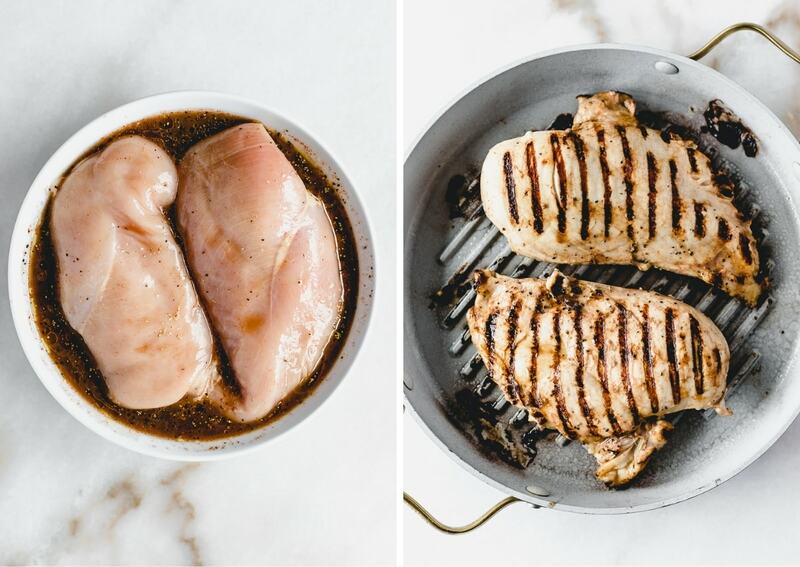 Place chicken breasts in the bag and let marinate for at least 30 minutes in the refrigerator. Meanwhile, prepare the salsa. 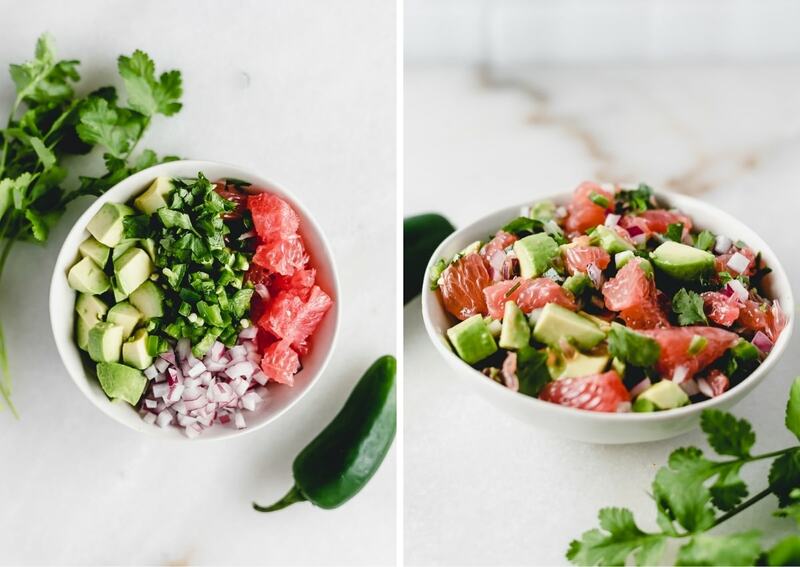 Roughly chop the other half of the grapefruit segments and add to a bowl with diced jalapeno, onion, cilantro, and avocado. Add a pinch of salt and gently stir to combine. Place in the refrigerator until ready to serve. Heat a grill pan or grill to medium heat. Spray with oil and add chicken breasts. Cook, flipping once halfway through, until chicken reaches an internal temperature of 165° F and juices run clear, about 10 minutes per side, more or less depending on the thickness. 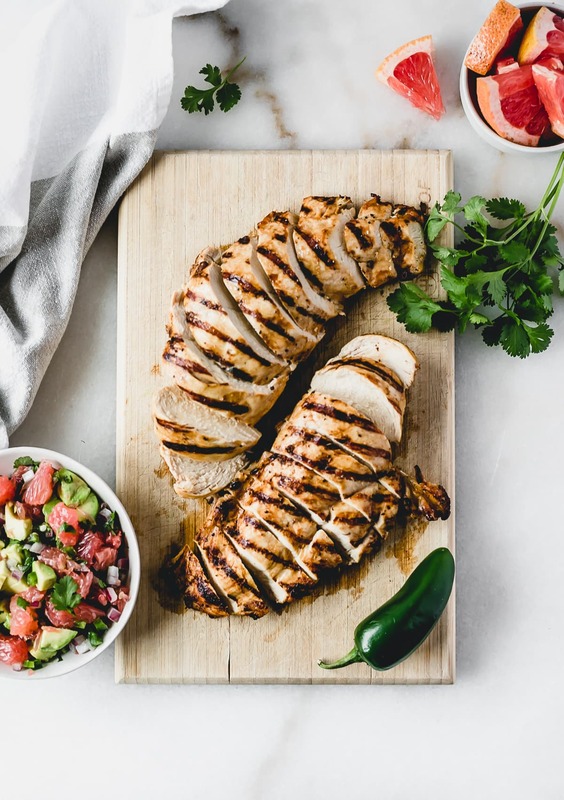 Remove chicken breasts from pan or grill once they are done cooking and top with grapefruit salsa. Serve immediately. Oh, it would be great with steak! 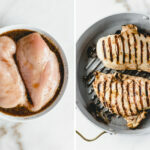 Do you remove chicken from marinade? Or does marinade go into pan with the chicken? You remove the chicken from the marinade. Enjoy! Thanks! I am enjoying your site, and recipes, immensely. That’s great to hear! Thanks for stopping by to comment!